CAPS concluded our weekend trip to Indiana at the Historic Roads Hotel located in the small town of Atlanta. We were met by the Gail Sanchez who kindly gave us a tour of the building. 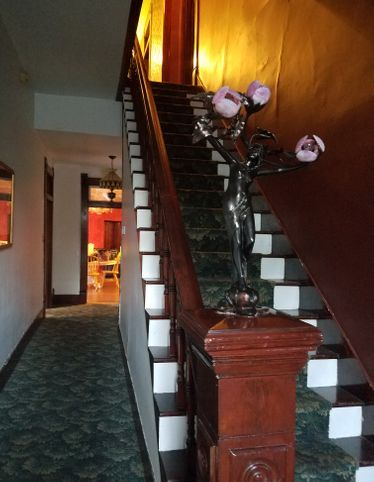 This beautiful two story structure was built in the 1890’s and served as a hotel, brothel and a speakeasy. It was in awe-inspiring shape as if we had stepped back in time with all the beautiful Victorian décor. Some of the particulars Gail related to us were of a 19 years old man named John who had died of TB in the early 19oo’s in an upper bedroom. We were also told the names of Sarah, associated with prostitution, and a man named Michael who may have been her “manager”. Reports of children running around the building have also been noted, along with a couple of female cooks that were reported to reside in the Kitchen. There have been sightings of a 7 foot shadow on the second floor, which I was not too keen on the happenstance of meeting! I stayed in the front room for most of the time with my K2 meter was going into the red. It did seem like someone was quite enthusiastic! Once the meter settled down I decided to meander around a bit starting with the main floor. I noticed a sudden robust aroma of what I thought was cigar smoke wafting through the air. As I made my way up the staircase, the K2 meter lit up once again. I wasn’t on the second floor long before I heard Dave and Trish returning with some presents for the hotel residents. 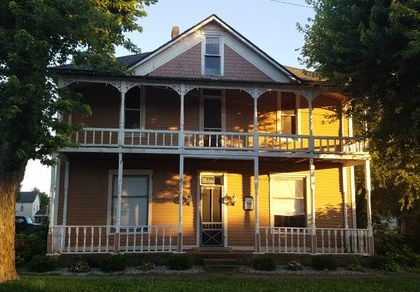 Dave decided to do an EVP session in Sarah’s room, one of the second floor bedrooms located in the front corner of the building. While Dave was on the bed, the headboard did a loud creak on the other side, as if someone had joined him. His camera was stubbornly refusing to flash at that point and he abruptly started to have breathing problems. When I went up the stairs, I smelled that same smoky odor as before and realized that I had neglected to relate that previous experience to the others. When I met up with Dave I mentioned it to him. He said he smelled it in Sarah’s room and had indeed tagged it on the recorder during his earlier EVP session. At that point we all ventured down to the opposite end of the hallway. After entering one of the back rooms Trish started having breathing issues, she soon became overheated and had to leave the area. Oddly Dave said he felt a cool breeze; I had cold chills running down my spine. We assembled a few minutes later in the downstairs dining area that we were utilizing as our staging area. This resulted in quite the conversation about food, specifically fried. As Dave was requesting that perhaps “the ladies” could cook for him, we heard a strange ding that sounded like a timer coming from the kitchen. When I went into the kitchen to look for the source of the sound, I got very chilled! Trish walked in and it hit her too. I then sat at the kitchen table while Trish and Dave went into a bedroom located next to the kitchen. It was very quiet until I heard the distant sound of the REM pod alarm going off. Dave and Trish were calling for me; they had set the REM pod up on the bed and it went bonkers for a few seconds. As I entered the room it was freezing! I joined Dave and Trish on the sofa and as I did, I felt a strong tingly sensation on my head. After a few minutes it left me, and then Trish felt electricity in her hair and something touching her arm. Trish was also repeatedly seeing some type of light on the bed. She described it as a dot in the middle of the bed and then it would fly away. We observed the doorway to the room seem to lighten and darken at intervals. At one point I felt an intensely strong sensation as if someone was on my left side with overwhelming cold chills and goosebumps. I wish I had appreciated the coolness because a few minutes later I felt overly warm and actually started to sweat all the while Trish was shivering with visible goosebumps. When we eventually wandered back upstairs, I felt dizzy and disorientated in the same back bedroom where Trish had felt ill earlier. The moment I left that area, I felt much better. I then entered into the room across from where John had reportedly died; I felt an intensity of cobwebbiness. 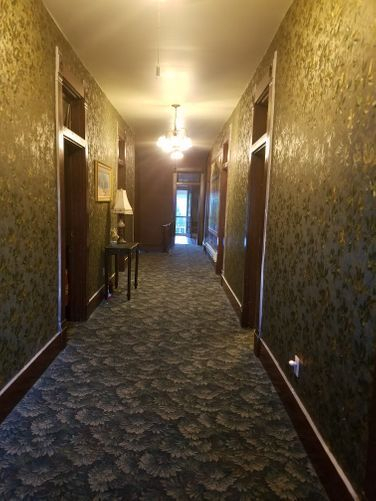 We decided to try an EVP session down the hall in another bedroom near Sarah and Michael’s quarters. We were amazed that we were unable to see each other through the darkness. Suddenly everything seemed to lighten; in fact I thought Trish was glowing! Dave said he could see the bed clearly, but still could not see us. Trish and I went back downstairs and smelled fried food cooking in the kitchen, like French fries. Well, we did have quite the discussion earlier about fried foods…While our mouths were watering with the pleasant kitchen odors; we made our way to the back bedroom again. After a few minutes and things were very calm we stepped into the bar area situated between the kitchen and bedroom. I felt a sudden coldness on my right side; as if someone had walked up beside me. At that point Dave decided to turn on some ragtime music, hoping to trigger some paranormal interactions. I don’t know that the spirits enjoyed it or were highly annoyed, but we had a really good time dancing around the building! 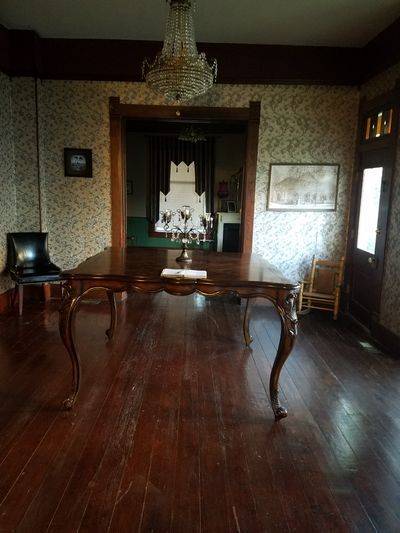 Between the fabulous haunted sites and the amazing people, we have always found Indiana to be quite the hospitable state for investigations. 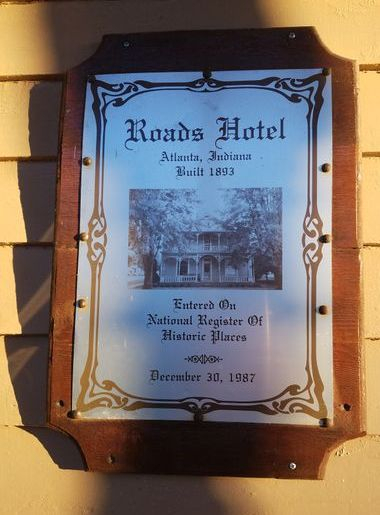 As for the quaint Roads hotel, it certainly holds a very special charm. Since our visit in July the ownership has changed from Gail Sanchez to Mike Couch with proceeds going to a worthy cause of the Lost Limbs Foundation. Just a few pictures to show this wonderful location. About 2 seconds into clip a female sounds like they are saying "Becky" just before I tag the recorder that I am taking pictures. This was captured upstairs. I had my recorder running as I walk down the stairs, Sounds like a female saying "Get out of here". In a room that has a piano next to the staircase, we captured this voice. Sounds to me like they are saying "Should I do that" between 1 and 2 seconds in before Dave speaks. We always love the whisperers! This was captured in the guest book signing area. Around 6 seconds a female whispers "They're gone". 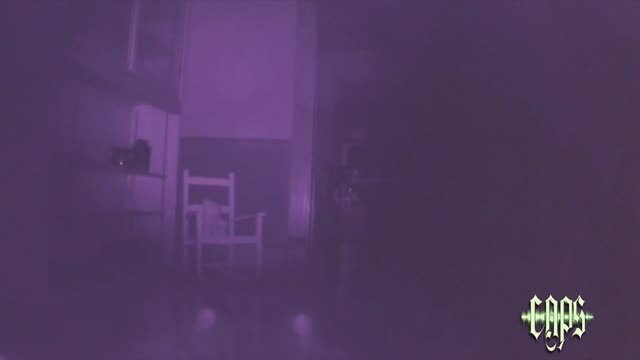 This is a clip from a video camera we left running downstairs in the front room. Around 5 seconds a voice that sounds like a child. This is during a break in the staging area dining room. About 1 second into clip a voice says either "Green" or "Great". Around 4 seconds is a child's voice that repeats it. This is from the downstairs bedroom. Could be saying something like "Jeremy left us"? In the first part of the video the camera was placed in the downstairs front sitting room, shooting towards the kitchen. The whole team was upstairs during this time. Some lights appeared on the screen. Spots to look out for are on the right side starting at 25 seconds . The light is small and round and becomes very bright. At 48 seconds double lights appear at little further to the right. Later that night those lights appeared at, spliced at about 1min 23secs. The tail end of the video was taken in upstairs hallway. Look near the lampshade to see light appearing, but then a shape appears and moves into the shadows. This is zoomed and enhanced at the end of the video..